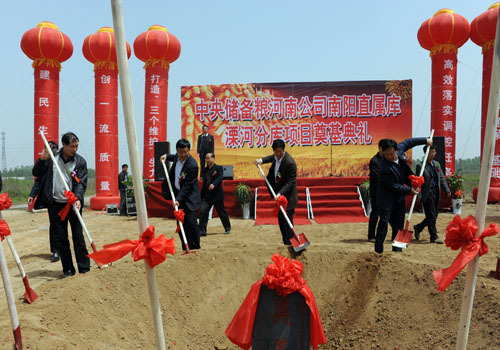 On April 29, 2010, China Grain Reserves Corporation Henan Subsidiary Nanyang Subordinated Storehouse Kulihe sub-storehouse project was commenced. China Grain Reserves Corporation Henan Subsidiary general manager Chen Huashe, China Grain Reserves Corporation Henan Subsidiary vice general manager Liu Xingzhu, Henan Tianguan Group’s president and general manager Zhang Xiaoyang, Henan Tianguan Group vice president Lu Mingzhang, Henan Tianguan Group vice general manager Wang Jingsheng, China Grain Reserves Corporation Henan Subsidiary Subordinated Storehouse former chief Yan Yuhe, Henan Tiangong Construction Group vice general manager Tian Jiansen, Zhengzhou Construction Engineering Group vice general manager Liu Xiuting and Nanyang Dadi Project Supervision Company chief inspector Qi Jun and other leaders attended the foundation stone laying ceremony. The project covers an areas of 204 mu with a designed capacity of 0.3 million ton which will be constructed in 3 stages. After all construction is finished, it will become the largest modern grain depot in the Southwestern Henan District. The project, based on the strong financial advance, resources advantage, channel advantage and network advantage of China Grain Reserves Corporation, will build a 0.3 million ton grain collection and storage facility with high standards, forming an integral grain storage and logistics base of collection, storage and transportation. After the project is completed, Lihe sub-storehouse will provide a solid assurance of materials for Tianguan Group’s steady operation and sustainable development, become a firm raw material storehouse of the company and strongly promote the development of Tianguan Group in the biomass energy industry.